Allen Mooreʼs retirement lasted just two hours. He had just finished designing and building a major project, the National Yiddish Book Center and Library in Amherst, Massachusetts. He looked back on a career of fifty plus years as an architect and a slew of unusual projects, from the Ocean Spray corporate headquarters and the Cranberry World Museum in Plymouth, Massachusetts to a cultural center in Israel. He was seventy-four. He had accomplished a lot. It was time, he decided, to lay down his tee-square. But shortly after arriving home in Newburyport, the phone rang. 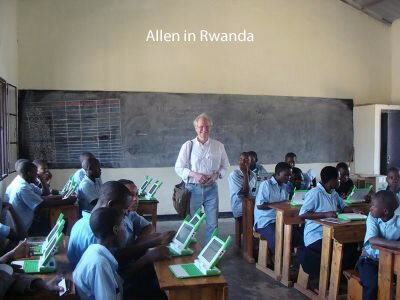 Allen flew to Rwanda several times and traveled to Rwinkwavu in the southeastern part of the country where he worked with h Betsy Dickey, the founder and chairman of Ready for Reading, a separately funded program of Partners In Health, that works with Rwandan teachers and librarians to facilitate literacy and the acquisition of IT (information technology) skills. Betsy had experience in-country. She had recently advised on the establishment of a library and IT center at the Kagugu Primary School, just outside the capital city, Kigali – that serves 3,000 children. As the focal point of the school, the library provides the space to support programs to promote literacy for students and the larger community as well as teacher training. Partly as a result of the libraryʼs success, Rwandaʼs president Paul Kagame had the adjoining classroom buildings rebuilt and modernized. In September 2008 laptops, designed by Nicholas Negroponte of MIT to provide inexpensive and sturdy computers for use in developing countries, were distributed to every child and teacher at Kagugu through his One Laptop Per Child Program. With the continued support of the Ministry of Education, the Ministry of Sports and Culture and local stakeholders, development began on a library and learning center in Rwinkwavu, southeastern Rwanda, serving a district population of approximately 20,000. 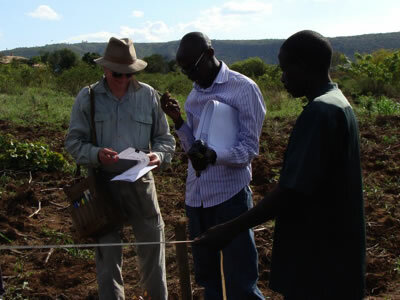 On his first visit, Allen went to the chosen site for the center, near a Partners in Health hospital (Some of you will recall Tracy Kidderʼs book – “Mountains Beyond Mountains” – which describes Doctor Farmerʼs formation of Partnerʼs in Health to provide health care to desperately poor people on three continents.) But the site was not promising. It was on uneven land and distant from the Rwinkwavu District Hospital. His vision was immediately adopted, but how to attract people to the new center? Because the new site has a natural slope to it, Allen envisioned an amphitheater as a first step to provide an audio/visual introduction to literacy. Allen reasoned that once people were enthusiastic about the location and natural usefulness of the center – once they had become stakeholders – the more formidable task of education in literacy and information technology could begin. “Information technology is important, but if people canʼt read, literacy teaching through books is the first step,” Allen says. Designing a center for so many differing needs was a daunting task, but after one and a half years of work and site visits that lasted about two weeks, Allen had drafted the program and construction documents for the Rwinkwavu Community Library and Learning Center. The amphitheater dominates the site on one side, opening onto a stage that is part of the southern entrance to the center. Flanking the entrance to the east are small offices for staff and a large reading room; to the west are classrooms designed for the multiple student populations that will use the center. He even found a nearby wood working co-op run by Fabrice Nusenga, a gifted carpenter. 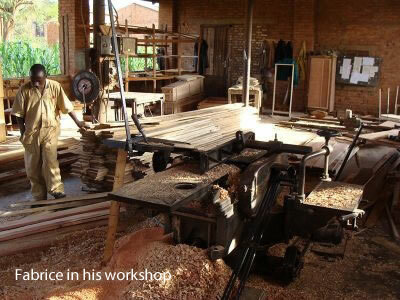 Allen spent time on his last trip to Rwanda working on construction details for all the furniture and mill work that were designed for the project. Already, the new Learning Center has drawn enthusiastic support from the larger Rwandan and international community. President Kagameʼs Ministers of Education and Sports and Culture are all on board and the adjoining Rwinkwavu District Hospital has become an integrated resource for the project. And in Kigali, a theater troupe has already begun visioning performances for the amphitheater to advance HIV/AIDS awareness, family planning and literary opportunities – among other programs. The plans are now ready, the site has been cleared with labor donated by the inhabitants of Rwinkwavu, multiple non-profit partners are engaged, and the people of Rwinkwavu are enthusiastic about their new village center for learning. All that remains is raising the funds – and that last task is off to a good start. The total needed is $450,000 and to date $250,000 of this has been committed. This article was written by Sam Low.